This is a comprehensive treatment of a neglected subject, long overdue, that charts in detail the sea and air operations of the British and Commonwealth navies (the French contribution was the FMS La Grandière, integrated in the Fourth Frigate Squadron Commonwealth, Task Force 90) and the Royal Fleet Air Arm in Korean waters 1950 - 1953. The technique highlights the problems and achievements of the four British carriers (Triumph, Theseus, Glory* and Ocean) and the Australian carrier Sydney, that operated consecutively off the coasts of Korea. 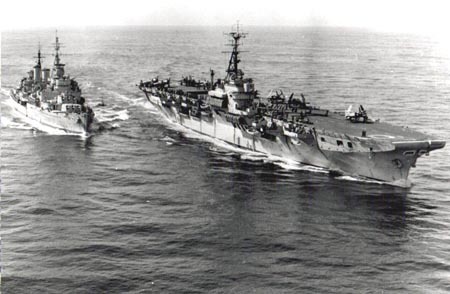 Triumph, for example, was the solitary Far East carrier in June 1950 and her obsolete Seafire 47s and Firefly 1s (800 and 827 squadrons) helped to cover the retreat into the Pusan Perimeter and the later Inchon landings. Theseus began patrol in October and her Seafuries and Firefly 5s (807 and 810 squadrons) provided Armed Reconnaissance (AR) , Close Air Support (CAS) and close interdiction sorties throughout the 'Mobile War' until 23 April 1951. The author stresses the fact that during the entire war there was no challenge to UN sea power**. This, he argues, was the 'absolute determinant' of the way the war was fought. The UN navies were able to carry out a wide range of operations, providing their own strike and Combat Air Patrol (CAP) cover. Consequently, the Korean war provided a classic example of the versatility and nature of sea power. During 1951-1953 Glory, Sydney and Ocean embarked no less than nine Fleet Air Arm Squadrons for patrols in which there were no full for the ship's companies, just solid unabating action for nine days and nine nights. The daily round of landing-on and take-offs, the reloading, the checking and general maintenance was wearing for everybody; and even when the carrier returned to harbour the demands on personnel were equally high. For the pilots and aircrews, operating off heaving decks or navigating through radiation fog that turned into stratus over the target, the hazards and levels of concentration were even more demanding. One of Ocean's claims to fame was the destruction of of a Mig-15 jet at the hands of Lieutenant Carmichael's Flight of four Sea Furies (802 squadron) on 9 August 1952. This was the first time that piston engined aircraft had shot down a MiG-15 and Lieutenant 'Hoagy' Carmichael received a DSC. Sydney's experience with the typhoon called 'Ruth' was fortunately not typical. On 14 October 1951, amidst torrential rain, the flydeck crews were subjected to a roll of 22°, a Firefly was washed overboard, the undercarriages of several Furies collapsed and the wind recorder "went off the board and broke". The author does not neglect the crucial importance of HMS Unicorn, the repair and ferry carrier that brought reserve aircrafts and supplies from the Naval Air Base at Singapore to Japan. She frequently carried spare aircraft to forward areas, provided a spare landing deck for the combat carrier and occasionally engaged ennemy positions with her own 4 inches guns. Unicorn was in the war from the start, bringing the 1st Battalion the Middlesex Regiment 29 August 1950; and she was there at the end, joining Ocean in a final patrol during July 1953. *) The sistership of Glory was HMS Colossus bought by French Navy and served later as "Arromanches"
**) Except the hair raising threat of russian made mines ... See the article MINE WARFARE KOREA 1950: Invasions of Inchon and Wonsan remembered - French and English supported operations ... by Léon C. Rochotte, French Navy KVet. (Publication: MINEWARNEWS October 1998, NSWC DD COASYAL SYSTEM STATION, Panama City Fa. USA - Editor: Frank Gregory, CSS Coastal Warfare Systems Dept. e-mail: GregoryFC@ncsc.navy.mil ). Also on the web "Inchon and Wonsan invasions Léon Rochotte's page" http://web.meganet.net/kman/nfleon.htm and http:/www.netmarine.net/forces/operatio/coree/mines01.htm in french.